Atty. 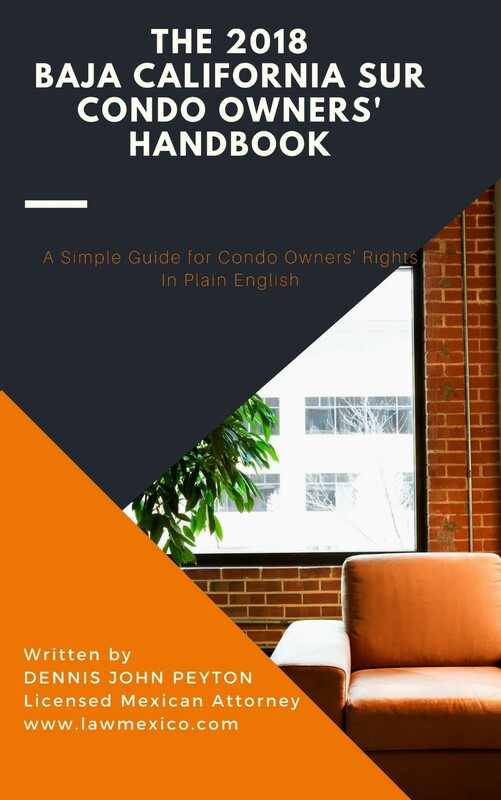 Dennis Peyton wrote this handbook in plain English to help foreign condo owners understand their rights and obligations when owning a condominium in the beautiful state of Baja California Sur. Foreign condo owners all over Mexico always have had the same complaint: “I don’t know where to get information about my legal rights in Mexico.” That is no longer the case. This is the first in a series of books I am in the process of publishing regarding the rights of condo owners in Mexico. More often than not, it isn’t the case that condo owners don’t have the rights to take charge of their property, rather, they simple have no way of investigating the law since there is very little in English. This book is the basis for you to get informed and get your condominium back under control. The Mexican government is aware of the problems and are there to help. But you need to be informed and take actions in your own defense if they are going to be able to help you. The Condo Law in Baja California Sur is a good example. The law is one of the most modern in Mexico and is very good at help you meet your needs. First you need to get informed and participate in the management of your condo property. Participating in your condo’s General Assemblies and knowing your rights is the first step. I hope this book and the ones to follow will help achieve your goals.